Would have to be a better Kiwi cricketer than this bloke KW and for me to make the trip. Now if it was Sir Richard Hadlee I would consider it. Have a great night anyway. Christopher Lance Cairns, ONZM, (born June 13, 1970) is a former all-rounder who played for the New Zealand international cricket team, the Black Caps, and is son of former New Zealand cricketer Lance Cairns. He starred in both the One-day and Test New Zealand teams, as well as the Canterbury New Zealand domestic championship team. Cairns also captained the Black Caps on seven occasions, usually when regular captain Stephen Fleming was unavailable. He was described by Shane Warne, the Australian leg spinner, as the best all-rounder in the world. Cairns finished his Test career with averages very similar to Ian Botham, who is considered by some to be Test cricket's greatest all rounder. Botham's batting average was 33.34 and his bowling was 28.40. Cairns' batting average was 33.53 and his bowling was 29.40. 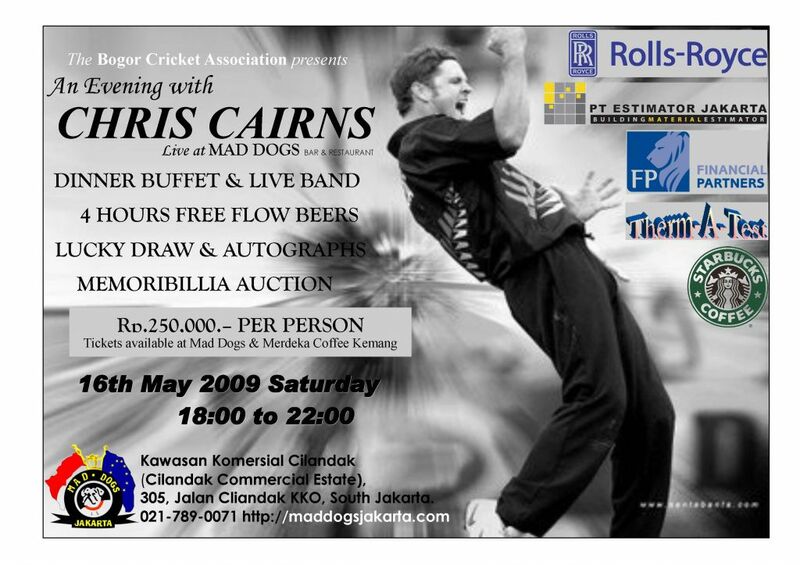 In 2000, Cairns was named as one of five Wisden Cricketers of the Year. Cairns formerly held the world record for most sixes in Tests (87, since surpassed by Adam Gilchrist), and shared the NZ record for fastest century in ODIs (75 balls, since surpassed by Craig McMillan). With the ball, Cairns' finest performance was 7/27 against the West Indies in a Test in 1998, and he is New Zealand's third highest wicket taker in Tests, after Richard Hadlee and Daniel Vettori. He is also one of only seven players to have reached the all-rounder's double of 200 wickets and 3000 runs. Out of these seven players, Cairns reached the double 2nd fastest (58 Test) behind Ian Botham. In ODIs, Cairns came agonisingly close to another double of 200 wickets and 5000 runs. Cairns finished his ODI career on 4950 runs, just 50 short. Cairns Test batting average at number 7 (44.02) is the 5th best average for that position of all time. No. I meant that Hadlee bloke. If Richard Hadlee was not in my top eleven cricketers of all time he would certainly be in my second 11! its also a top 13 not a top 11 ! ^^ Mate you could swap the openers for Boycott and Gavasker and wouldn't suffer as well as most of the other players except for Bradman, Sobers and Bothman. You would have to leave these 3 in any best side! Well stick Mike Proctor (Steve Waugh) and Kapil Dev (Imran Khan) in there then.